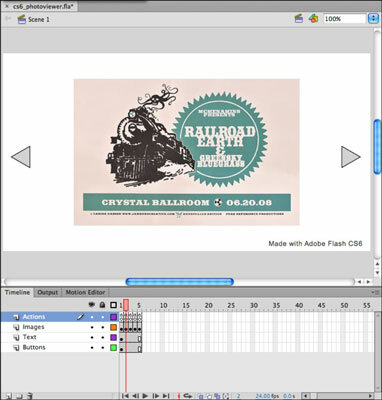 Because the idea in creating the Timeline in Adobe Flash CS6 was to create a photo viewer, a user should be able to determine when the next photo is viewed, so you need to stop the timeline at each photo to give them a chance to view it. Preview your movie by choosing Control→Test Movie (Windows) or Command→Test Movie (Mac). Notice that the Timeline plays through continuously. The stop actions you add soon will fix this problem. Close Flash Player and return to your Flash document. In the Timeline panel, drag the playhead to the beginning of the Timeline (Frame 1). Choose Window→Code Snippets to open the Code Snippets panel, or expand it from its icon view in the panel group on the right. You can undock the Code Snippets panel for easier access by dragging the panel out of its group on the right side. Locate and expand the Timeline Navigation folder in the Code Snippets panel. Double-click the snippet labeled Stop at this Frame. A new layer (named Actions) is added to the Timeline, and a stop action is added at frame 1. Every time a code snippet is added, the Actions panel opens to show you the code that was created. A quick and easy way to return to the Code Snippets panel is to use the Code Snippets button at the top of the Actions panel. Repeat Step 6 for Frames 2, 3, 4, and 5, respectively, so that you have a stop on each of the five frames. Preview your movie by choosing Control→Test Movie (PC) or Command→Test Movie (Mac). This time, you remain stopped at frame 1.
Credit: Poster images designed by and courtesy of Jambone Creative.